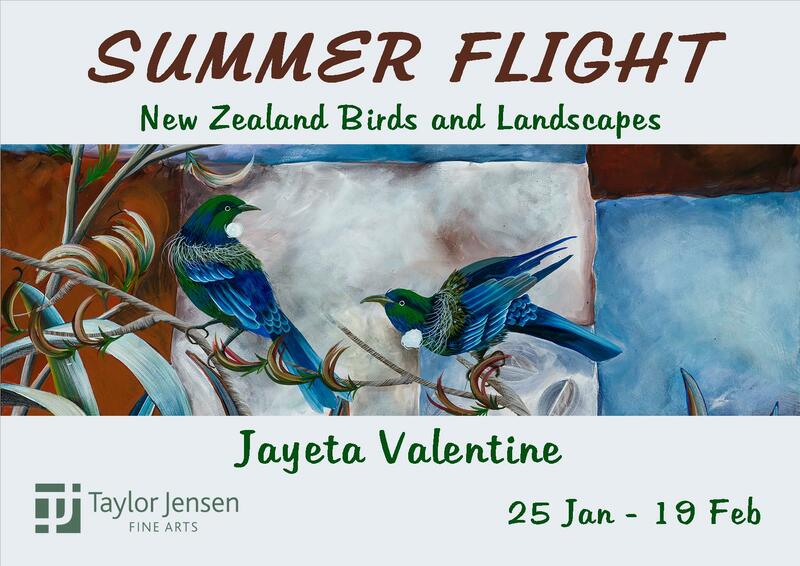 Taylor-Jensen Fine Arts opens its changing exhibition programme for 2019 with an exhibition of naturalistic paintings by Jayeta Valentine, an artist based in New Plymouth, Taranaki. Summer Flight: New Zealand Birds and Landscapes is an exhibition of recent paintings by a virtuoso who although she dabbled in ‘arty things’ since childhood started painting seriously only fifteen years ago. “Since then I have held six solo, sell-out exhibitions and been represented by several New Zealand galleries.” Jayeta was keen to show her work in the Manawatu as we were to make her paintings available to the art buying public. Summer Flight will feature 20 unique works by this talented artist.